Can the product 'Anti-Pax2 antibody - ChIP Grade (ab23799)' be used for chip in chicken tissue? Thank you in advance. 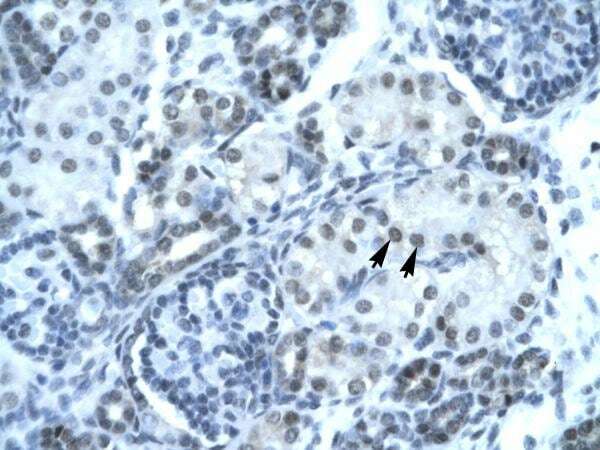 I am sorry to confirm that as far as we are aware, ab23799 Pax2 antibody has never been tested with samples from chicken. All tested and guaranteed species cross-reactivity and application information is stated on our datasheets, and these are updated as soon as any new information is brought to our attention. I can confirm that the immunogen for the antibody has 98% alignment with the chicken protein. This is very high, and so it is likely that the antibody will detect in chicken. However, I am sorry we are not able to provide our guarantee for this without laboratory testing. If you would like to test the antibody in chicken, please do not hesitate to contact me by replying to this message prior to the purchase as you may be eligible for our testing discount program. How manytests can be done? What's the working dilution for IHC-P? In english, please. We recommend to use this antibody ata concntration of 4ug/ml in IHC-P (since the conecntration of ab23799 is 1mg/ml, this is a 1:250 dilution). This is only a recommended starting dilution and may well have to be optimized by your customer according to their needs and samples. If the recommended dilution is used and ca 50ul per slide (this depends on the size of the sample on the slide, it needs to be covered all the way) then one vial of ab23799 will be enough for250 slides. https://www.abcam.com/index.html?datasheet=23799 (or use the following: https://www.abcam.com/index.html?datasheet=23799). I hope this information was helpful and wish your customer good luck with their research. I am very pleased to hear you would like to accept our offer and test ab23799 in mouse tissue. This code will give you 1 free PRIMARY ANTIBODY before the expiration date. To redeem this offer, please submit an Abreview for mouse tissue and include this code in the “Additional Comments” section so we know the Abreview is for this promotion. For more information on how to submit an Abreview, please visit the site: www.abcam.com/Abreviews. know if you require any other information. Unfortunately the number you provided is not an Abcam order/reference number. Did you order the antibody directly from Abcam, or through a sub-dealer? If you can’t find the original Abcam order number, can you let me know the date it was ordered, the institution it was sent too and who placed the order and I should be able to find your order that way. Thank you very much for your interest in ab23799. Aswe talkedabout on the phone ab23799 has not been tested in mouse tissue. Therefore, I can offer a discount off a future purchase if you can provide me with your original Abcam order number for ab23799, test it in mouse tissue and submit feedback to us in the form of an Abreview. It doesn’t matter whether the Abreview is positive or negative, we would just really like to receive your feedback. The discount would be to the value of 1 free PRIMARY ANTIBODY. 1. Reply to this e-mail to let me know that you would like to proceed and test ab23799 in mouse tissue. I will then send a discount code. This code must be issued before purchasing ab23799 so please wait for my reply before ordering. 2. Purchase ab23799 either by phone, fax, or online (www.abcam.com). 3. Test it in mouse tissue. We are always pleased to obtain feedback about our products and any information is greatly appreciated! Even if ab23799 turns out to be unsuitable formouse tissue, you will still receive the discount on your next purchase after your Abreview has been submitted. Thank you very much for your reply. 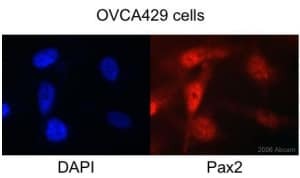 Since there is no other chip-grade Pax2 antibody available, surely I would like to test it in chicken tissue, probably first with a simple western blot and then try the chip. Is it possible that you let me have a little test sample to try? And I will send you the feedback once I get the result. It it works, I of course will purchase the product. I am pleased to hear you would be interested in trying ab23799 in chicken samples. I am sorry that because we have over 70 000 products, it is regrettablynot feasible for us to have samples vials to send out to customers. However, I can offer a discount off a future purchase if you buy ab23799 now, test it inchicken and submit feedback to us in the form of an Abreview. It doesn’t matter whether the Abreview is positive or negative, we would just really like to receive your feedback. The discount would be to the value of 1 free primary antibody. 1. Reply to this e-mail to let me know that you would like to proceed and test ab23799 in chicken. I will then send a discount code. This code must be issued before purchasing ab23799 so please wait for my reply before ordering. 3. Test it in chicken. We are always pleased to obtain feedback about our products and any information is greatly appreciated! Even if ab23799 turns out to be unsuitable for chicken, you will still receive the discount on your next purchase after your Abreview has been submitted. We do not have set expiration dates for our products. Most antibodies are stable and can last for anywhere from a few months to several years if stored properly, so we strongly recommend that you follow the storage instructions on the datasheet for the antibody purchased. These conditions will vary among our antibodies, therefore, it is important to verify the storage conditions for each of our products when you receive them. We guarantee all of our products to work for at least 6 months from the date of purchase when stored correctly. For more information on antibody storage and stability, please visit our Antibody Storage Guide on our Protocols and Troubleshooting Tips page (https://www.abcam.com/index.html?pageconfig=resource&rid=10795, and attached). DISCOUNT CODE: XXXXXXXX Expiration date: 13-01-2012 I am very pleased to hear you would like to accept our offer and test ab23799 in Zebrafish. This code will give you 1 free PRIMARY ANTIBODY before the expiration date. To redeem this offer, please submit an Abreview for Zebrafish and include this code in the “Additional Comments” section so we know the Abreview is for this promotion. Remember, we publish both positive and negative Abreviews on our datasheets so please submit the results of your tests. The code will be active once the Abreview has been submitted and can be redeemed in one of the following ways: 1) Call to place your order and mention the code to our customer service department; 2) Include the code in your fax order; 3) Place your order on the web and enter the promotional code. Any feedback that you can provide will be greatly appreciated, whether positive or negative. If you have any further questions, please do not hesitate to contact us. We look forward to receiving your Abreview and wish you luck with your research. The terms and conditions applicable to this offer can be found here: www.abcam.com/collaborationdiscount.